Moisturizes and protects small irritations. v Also suitable for dry skin with atopic tendency. Soothes and protects the softness of baby skin. Help protect her skin against everyday minor irritations (layers, moisture, heat, cold ...). Easy to apply, absorbs quickly, does not stick. Apply on face and body clean and dry your baby. 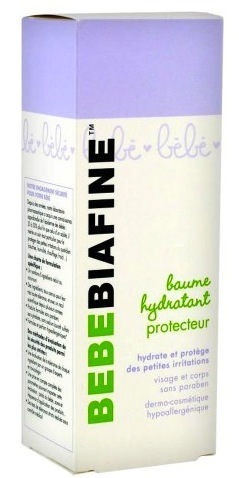 Moisturize baby's skin, especially in areas exposed to cold and wind (face, hands ...) and after bathing. Formula INCI: Aqua, glycerin, cetyl alcohol, cocoglycerides, Sorbitol, Dimethicone, ethylhexylglycerin, annuuss helianthus seed oil, stearyl alcohol, myristyl alcohol, p-anisic acid, zea mays starch, hydrogenated palm glycerides, potassium cetyl phosphate, carbomer, disodium EDTA , sodium hydroxide, tocopheryl acetate, tocopherol, sodium benzoate, phenoxyethanol, fragrance. Paraben-free. Phthalate free. Without sodium laureth sulfate. Hypoallergenic. Tested under medical supervision.